More tickets will go on sale in 2019. Kasia and Ewelina Nosal at Electric Picnic last weekend. EARLY BIRD TICKETS for 2019′s Electric Picnic festival have sold out. Loyalty tickets and family camping, family campervan and campervan tickets also sold out after going on sale at 9am today. The tickets sold out within four hours – a new record. The exact number of tickets released this morning has not been confirmed, and people will have another opportunity to buy tickets next year. 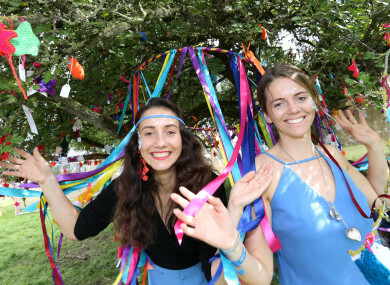 The music and arts festival took place in Stradbally in Co Laois last weekend. Tickets for this year’s festival sold out in March – less than 24 hours after the lineup, which included headline acts Kendrick Lamar, Massive Attack and Dua Lipa, was announced. Ticket prices will remain the same for 2019. Under its loyalty scheme, if you have been to the festival three times or more a ticket will cost €165, if you’ve been once or twice a ticket will cost €185 and if you haven’t been before it will cost €205. About 55,000 people attended the festival at the weekend, with capacity expected to increase to 57,500 next year. The lineup for the 2019 festival, which will return to Laois from 30 August to 1 September, won’t be announced until next year. Email “Early bird tickets for next year's Electric Picnic sell out ”. Feedback on “Early bird tickets for next year's Electric Picnic sell out ”.